Freshman pitcher Aaron Eden delivers a pitch against San Diego on Feb. 26 at Tony Gwynn Stadium. 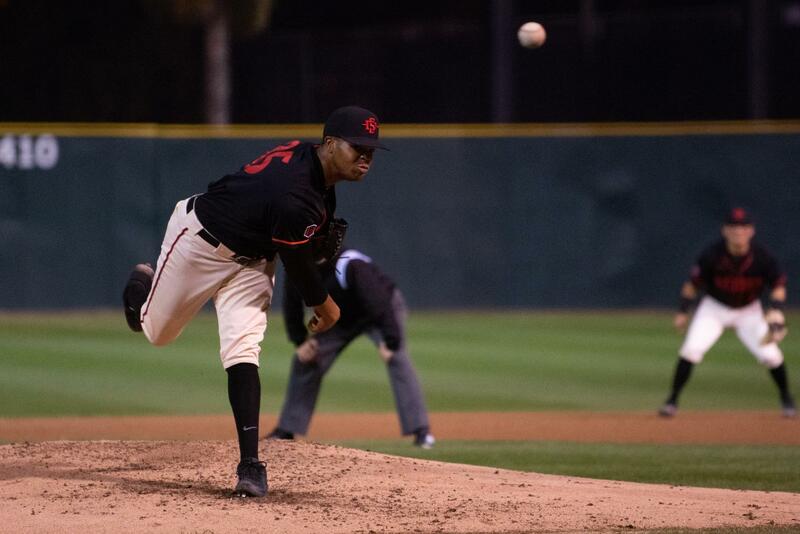 San Diego State baseball has had a recurring problem on the mound with its starting pitchers. 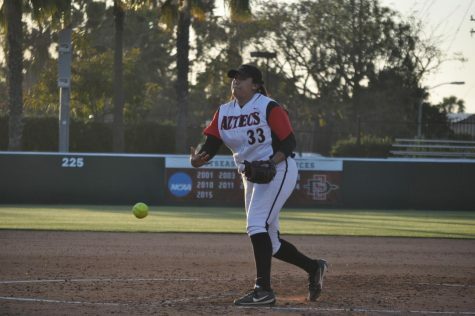 The Aztecs’ (14-10, 4-3 MW) starting pitching staff isn’t going deep enough into games. The lack of deep starts and a number of injuries to the starting pitching have forced position players to make their debuts on the mound. By definition, a starting pitcher needs to last at least six innings and prevent less than three runs from scoring for the outing to qualify as a quality start. 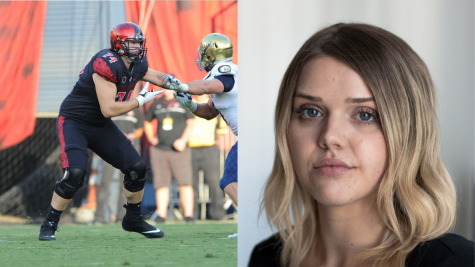 SDSU has only had four quality starts from its pitchers so far this season. 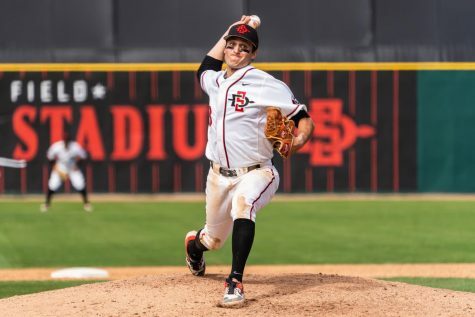 Freshman Aaron Eden (2), senior Justin Goossen-Brown (1) and freshman Michael Paredes (1) are the only three pitchers to give the Aztecs a quality start this season. Head coach Mike Martinez said the pitching staff could use deeper outings from its starters. “This time of year if you can get at least a five-inning start out of your starters, I think you can hand it off to your bullpen then that’s pretty good. 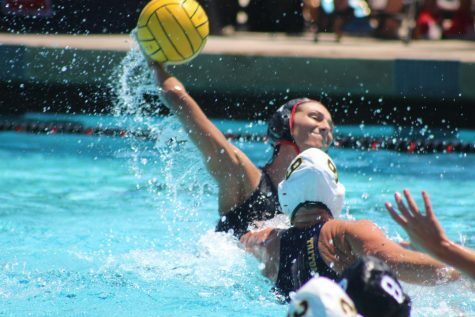 If we can get those types of starts every night, we can have a chance to win,” Martinez said. 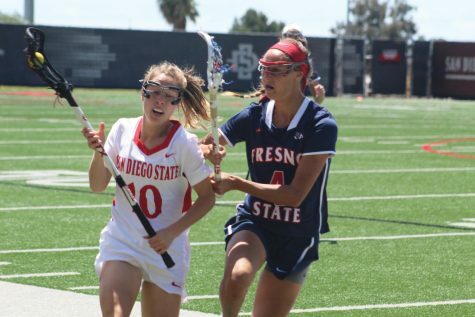 Paredes, the starter against Cal Baptist on March 26, was the latest to join Eden and Goossen-Brown as the only Aztecs to provide quality starts. The San Diego native hurled six innings and allowed three runs, while notching seven strikeouts. Paredes said quality starts from the starting pitching can benefit the bullpen. “We’re coming out and trying to do our best to start the game off rolling and pound the zone to get our bullpen guys there and only (have) them come in when we really need someone,” Paredes said. 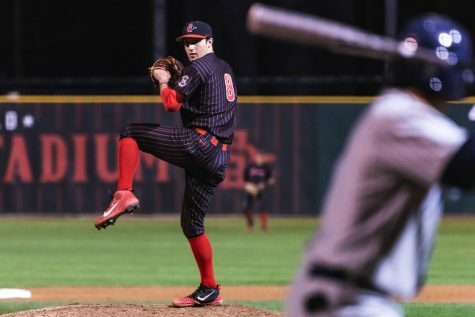 Sophomore Logan Boyer and seniors Harrison Pyatt and Brad Wegman were the three Aztec starting pitchers from the team’s season-opening series against San Francisco, but the trio has been sidelined with injuries. Boyer’s last outing lasted only two-thirds of an inning against CS Northridge on March 12. Martinez said the timetable for the two to return is still up in the air. “We don’t know yet. Logan Boyer is a little further away than Harrison Pyatt, and we’ll kind of see how that shakes out in the next two weeks,” Martinez said. 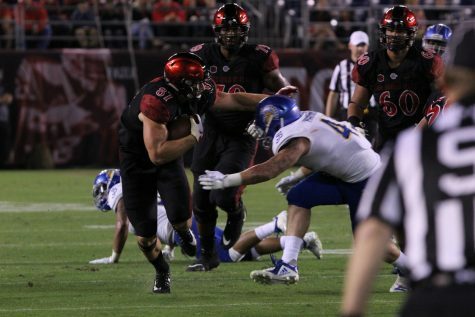 Due to the lack of depth in the pitching staff, the Aztecs turned to junior center fielder Julian Escobedo and freshman first baseman Brian Leonhardt to fill the holes. 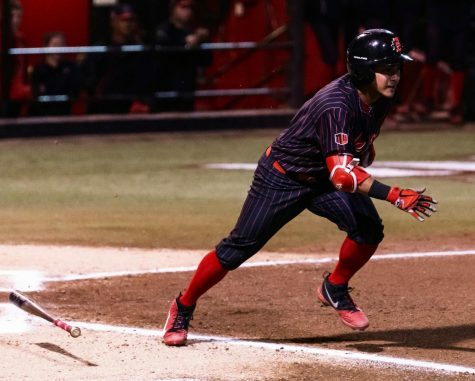 Martinez said he intended to use more position players on the mound following the team’s win against Seattle University on March 17, as the team prepares to play nine games in two weeks. The Aztecs utilized sophomore Casey Schmitt as the team’s third baseman and closer in 2018, and it was a success as he sported a 0.28 ERA in 32 innings pitched. However, Escobedo and Leonhadt haven’t had the same success. Escobedo’s lone shot on the mound was a blown save against then No. 11/14 Texas Tech on March 6 and Leonhardt has only been able to throw 6.1 innings in four outings, which includes a 3.1-inning start against Arizona on March 26.